Copter-3.4 (and higher) includes automatic learning of hover throttle which means manually setting the parameter is generally not required. If you have a slightly overpowered or underpowered copter the throttle required to keep the vehicle in a stable hover may be under 40% or over 60%. Although this is fine while flying purely stabilize mode it can lead to a rough transition to autopilot modes (Alt Hold, Loiter) where having the throttle outside of the 40% ~ 60% deadzone will be interpreted as meaning you want the copter to climb or descend. For this reason it is a good idea to adjust the Throttle Mid parameter (also known as THR_MID) so that your mid throttle while in stabilize mode is closer to 50%. When the Log Browser appears, scroll down until you find any CTUN message. Click on the row’s “ThrOut” column and push “Graph this data Left” button. While referring to the scale on the left of the graph, estimate approximately what the throttle level was during the hover. In the example above (which was an unnecessarily long flight) the mid throttle appears to be about 550. If the average throttle is above 700 (i.e. 70%) then you have a very underpowered copter. You should consider increasing the power of the motors and ESCs or use a higher voltage battery (i.e. switch from a 3S to a 4S battery). Copter-3.4 (and higher) includes automatic learning of mid throttle (aka “Hover Throttle”). 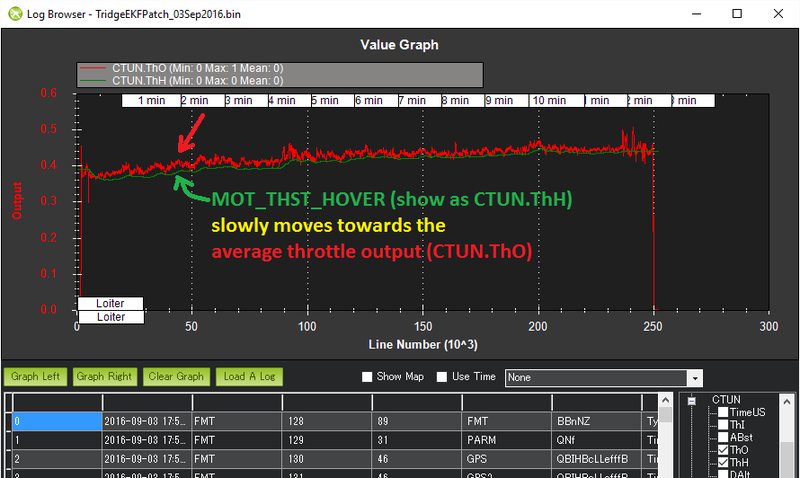 The MOT_THST_HOVER value will slowly move towards the average motor output whenever the vehicle is holding a steady hover in non-manual flight modes (i.e. all modes except Stabilize and Acro). If you wish to manually set the MOT_THST_HOVER value, it is best to download a dataflash log and set the value to what is seen in the CTUN.ThO field. The value should be between 0.2 and 0.8. If for some reason you wish to disable learning, you can set the MOT_HOVER_LEARN parameter to 0.